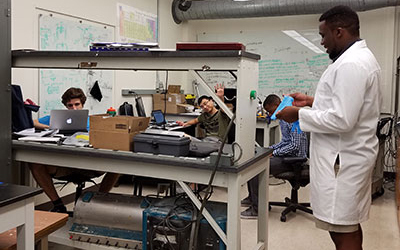 Beauclaire Mbanya Jr. ’20 is a chemical engineering student from Cameroon working on liquid metal batteries for his Xerox Engineering Research Fellowship. His project compliments the work he is already doing as the co-founder of a UK-based organization CareforSeven. CareforSeven focuses on training over 40 underprivileged high school students from electricity deprived areas in Nigeria on how to build a solar charger. The organization also empowers students with entrepreneurial skills to monetize the chargers for their communities. 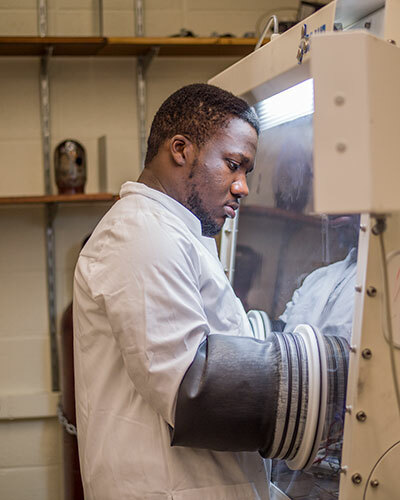 Through the Xerox Fellowship Project, Mbanya is investigating the influence of different electrolytes (substances that conduct electricity) on the performance of a Lithium-Bismuth liquid metal battery. This kind of battery is key in addressing problems of energy storage in solar grids. This Xerox fellowship is Mbanya’s first research experience at the University of Rochester. He is happy to be in an environment where his fellow lab mates are passionate, collaborative, and excited about working together. Mbanya chose his project after reading Elon Musk’s biography, in which the author goes into detail about Musk’s work developing the Tesla battery. 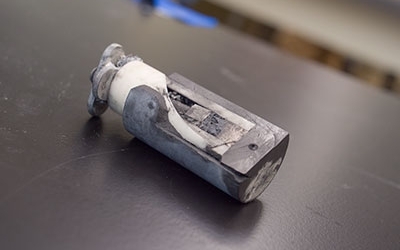 In the lab, Mbanya designs, builds, and cycles batteries made of lithium-bismuth liquid metal electrodes separated by a molten salt electrolyte. To cycle a battery, he charges and discharges it over and over until it is used up. After cycling, he cuts a cross-section of the battery, then analyzes the cycling data and its structure with a scanning electron microscope. The lab is tight-knit, so there is a lot of interaction with other researchers, including graduate students and the professor who runs the lab. At the end of each day, everyone gets together to share their work and exchange ideas with each other. Mbanya builds a battery inside a "glovebox". The box is sealed and filled with an inert gas like argon.